'Louis L'Amour': Listen to Jan..
MTSU educators are preparing to infuse their spring 2016 courses with fresh perspectives after joining an interfaith community luncheon co-hosted by the university. 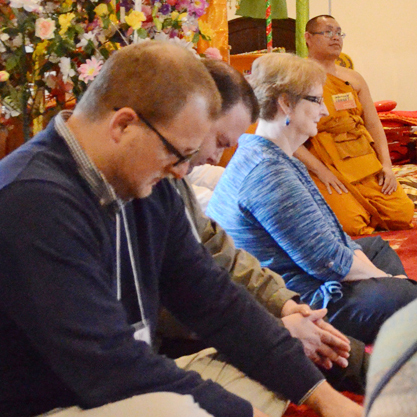 The American Democracy Project and the Center for Historic Preservation joined forces with the Family of Abraham and Wat Amphawan of America for a day of workshops and civil dialogue at one of Murfreesboro’s Buddhist temples. “Being intimate with our fellow man, being able to sit and talk and be real and human and kind, warms my heart at its very base,” said Dr. Mary Evins, coordinator of MTSU’s American Democracy Project and a CHP professor. Evins’ grant from the National Endowment for the Humanities is funding the “Bridging Cultures at Community Colleges” program in partnership with Jackson State and Cleveland State community colleges. Academics from all three institutions and around the country gathered at MTSU in July 2015 for five days to collaborate on ways to give community college students more exposure to religious and cultural plurality. The Jan. 15 community luncheon allowed scholars and community leaders of various faiths to communicate in a less formal, more social atmosphere. After blessings in Protestant, Catholic, Jewish, Islamic, Buddhist and Sikh faiths, participants dined on a Thai buffet meal under the gaze of a golden Buddha statue. “Things like this make me more aware of culture and make me more aware that I need to put more emphasis on people from different backgrounds,” said Nigel Bradley, an adjunct professor of literature at both Jackson State and the University of Tennessee-Martin. Pat Halser, a member of the Nashville-based Family of Abraham interfaith group, spoke of her work with an organization created to promote better relations between Jews and Muslims. The Rev. Joe Pat Breen, a retired Catholic priest, delivers the Christian blessing prior to an interfaith luncheon at Wat Amphawan Buddhist Temple in Murfreesboro Jan. 15. The temple, the American Democracy Project, the MTSU Center for Historic Preservation and the Family of Abraham groups co-hosted the special luncheon. “It just makes it easier to understand another person’s perspective when you’ve actually talked to that person instead of just reading something about them in a book or watching something on television,” Halser said. Robin Abudiah, a Thompson’s Station resident who worships at the Islamic Center of Murfreesboro, dined with Halser. “What I came to realize is how little I did know, and what I did know was a lot of false information, even though I had gotten it from reputable sources,” Abudiah said. Evins said the next step is to continue faculty collaboration to increase ways of broadening students’ religious and cultural knowledge. For more information on the “Bridging Cultures at Community Colleges Program,” contact Evins at 615-904-8241 or mary.evins@mtsu.edu.